MY GOSH! THIS IS EPIC! Thanks for your time in compiling this historical info. I was wondering about how Komplete has evolved over years, and then stumbled onto your blog from another post... then found this! @Torley - Thanks, brother. I've been a Torley fan since the early 2000s, by the way. KORE Soundpack Animated Circuits actually IS a part of Reaktor's factory library, as it consists of these ensembles: Metaphysical Function, Newscool, Skrewell, SpaceDrone, Spiral, Spiral with Steampipe. All of these (except the last one - easily done by the user) can be found in the factory library. Fixed it. I had read something about Spiral being the only thing that made it into Reaktor, but apparently what that really meant was it was the only thing that wasn't already in Reaktor to begin with. Thanks. @ED - Good catch, fixed. Also added the "PreSonus Vol. 1" soundpack to the list, which was apparently a free download for registered Studio One users for a while- although I haven't found anything about what it contained yet. Presonus KORE pack was just a selection of 200 KORE factory presets for Studio One owners, or something... So, nothing new as far as content is concerned. Thank you very much for this post it is very helpful to read about. Thanks for all the time and work you put into making this! Thank you for putting this info together! My main computer died last July. I finally got a permanent replacement and I am now having to reload all my audio software and your article saved me a lot of grief. was given as a Holiday freebie Dec 2014 and pulled from NI's website in Feb 2015. Fantastic! I've been looking for something like this for some time. Wow. Great work and very useful. Thanks for doing this. This was really interesting! Also thanks for sharing the tables too, I spent nearly an hour studying them! 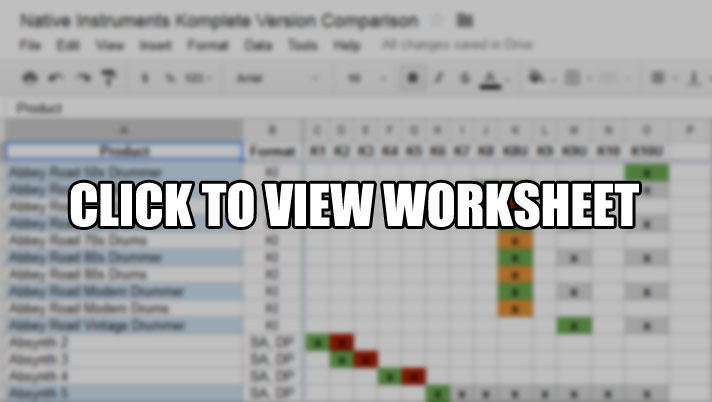 For what it's worth here is a link to a spreadsheet that has links to videos about each of the plug-ins and instruments in Kontakt Komplete Ultimate 10 as well as all the manuals downloaded with clickable links in the MS Excel spreadsheet. I also included the spreadsheet here to have everything together if it helps anyone. Love the spreadsheet. I recently picked up Komplete Kontrol, now I need to update my Komplete bundle. This detail helps me contemplate when K11 will release. Hopefully between Sept - Oct.
@mistawil - There is a rumor that Native Instruments has slipped into an 18-month cycle for Komplete. (Both K9 and K10 were released after ~18 months, compared to previous releases which were mostly released annually.) There's not enough data to know whether the 18-month thing is a pattern, but I consider the September release of Reaktor 6 a possible hint that we won't see Komplete 11 until next March or April. But again, still too early to say. Thank you, i'm trying to understand something. In your spreadsheet notes for "Post Komplete 10 additions" you said that the Symphony series will not be added to Komplete 11. So will it be added to Komplete 11 Ultimate or will ALWAYS be separate? I'm waiting until Komplete 11 comes out for the upgrade and will probably stay with Komplete 10 Ultimate if these series stay outside the bundle. Also, where did you get the information that the Symphony series won't be bundled with Komplete? @figurethisout - The current layout of the Native Instruments site makes this confusing, since they still break it up into only Komplete, Traktor, and Maschine categories, but if you take a look at the product page for the Symphony Series Brass collection, it says the following about the new Symphony Series: "This growing range of top-of-the-line products defines a new benchmark for highly-innovative orchestral instruments and will not be included in KOMPLETE or KOMPLETE ULTIMATE." Here's a screenshot of the relevant section of the page. 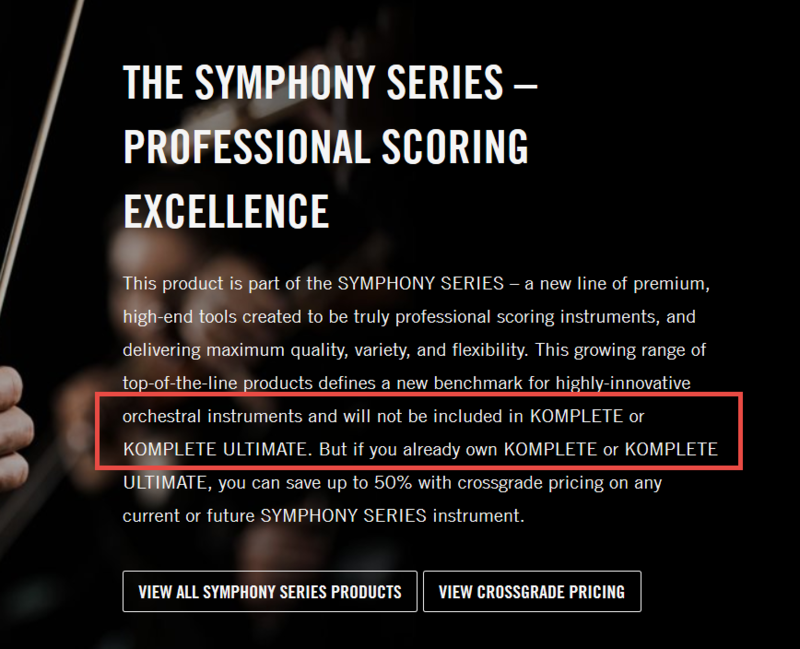 It looks like Komplete owners will have a standing crossgrade offer on all Symphony Series products, but NI has no plans to actually make them part of the Komplete bundle. Thanks for this. I don't remember how or when I downloaded the .xls file but I'm home sick and just found it in Excel on my old iPad and it gave me a few hours of relief in an otherwise crappy day. I always wondered why Spektral Delay and Vokater were discontinued.